The Canvas team is also available for one-on-one appointments and consultations. Contact us at canvas@tufts.edu to request an appointment. We will resume group trainings and open labs when Spring 2019 Canvas course sites become available later this fall. Summer 18 and Fall 18 course sites for Fletcher, Friedman, ASE, and PHPD courses are available on Canvas. If you have teaching materials from previous semesters on Trunk, now is the time to move them to Canvas and start building your new course sites. We have outlined your options for migrating content from Trunk to Canvas in our migration guide. Whether you export content from Trunk yourself or request content migration from ETS, it’s important to know what material gets migrated and what is left behind. Once your content migration is complete, it’s time to take a look at your course site and get it ready for the new semester! Any downloadable files in the Resources area of your most recent Trunk course site were migrated to the Files tool in Canvas. This includes files and folders that were hidden from students. Folders and files are named as they were originally named when they were first uploaded to Trunk. Take a look at your Files in Canvas. Delete files that are duplicates or out-of-date, rename anything with a confusing file name, and put things into folders so you can easily find them. For more, see How do I use Files as an Instructor? In the Actions drop-down menu to the right of your link, select Edit Content. Copy the address in the URL box. Open a text editor on your computer (Notepad or TextEdit). Paste the URL into a text file. Repeat for any links you want to save. The Files tool in Canvas is a basic file storage space. To give students access to files — as well as links, assignments, and other course material — create Modules or Pages. For more on how to create Modules, see What are Modules? If you prefer more flexibility in how you present your course material, you can use the Pages tool to create HTML pages with links to your Canvas content. Pages allow you to write free text, include images, and embed media files in a page along with direct links to files, assignments, quizzes, and other course elements. For more on how to create Pages, see What are Pages? Published Assignments and Quizzes were migrated from your Trunk course site. Review your new Assignments and Quizzes in Canvas, edit and update content, adjust due dates, and delete anything you no longer need. Use the Syllabus tool in Canvas to post your Spring 2018 syllabus. You can link to a Syllabus document by uploading it into Course Files and linking it in the content selector. You can also paste text from a Word document into the Syllabus page. You can even automatically generate a schedule of activities from your assignments and events in Canvas. For more, see How do I use the Syllabus as an Instructor? After you’ve reviewed your material and you are ready to make your site available to students, publish it by clicking the Publish icon in the sidebar. Don’t panic! Your previous course sites on Trunk are still available. If you lost track of a file or forgot to save a web link, log in at trunk.tufts.edu to access your old course and retrieve the material. Rollout update: Who’s moving to Canvas in 2018? After a successful first semester using Canvas at select Tufts schools and programs, we are looking forward to bringing Canvas to the rest of the community. Which schools and programs are moving to Canvas this year? All Tufts Summer Session courses will begin using Canvas in May 2018. All courses at the School of Dental Medicine will begin using Canvas in July 2018. This includes courses in the D.M.D. program, combined degree programs, and postgraduate programs. The School of Arts and Sciences and the School of Engineering will begin using Canvas for Fall courses in September 2018. Courses at the Fletcher School, the Friedman School, and the School of the Museum of Fine Arts have been using Canvas since Fall 2017. When can I start working on my Canvas course site? We expect course sites will be available for Summer Session courses the week of February 5. Course sites will be available for Fall ASE courses in mid-March. Instructors of Summer and Fall courses will be notified via email when course sites are ready. Will my course material be moved to Canvas? We have developed tools and procedures to migrate files, assignments, assessments, and other materials from TUSK and Trunk to Canvas. The details of content migration may vary from school to school, but we will provide everyone with an easy way to migrate material from their current system to Canvas. Are Trunk and TUSK going away? Will I be able to access old materials on Trunk and TUSK? Trunk and TUSK are still in active, fully-suppported use. You are able to log into the systems as you always have and access previous course sites and material. When we determine a date that we will stop supporting Trunk and TUSK we will communicate that information to users with plenty of advance notice. How will I learn how to use Canvas? At the Dental School, the Educational Technology staff, with support from TTS Educational Technology Services, will offer training workshops to instructors and staff in the spring. At all other schools and programs, Educational Technology Services will offer a variety of online and in-person training sessions and workshops. Training will be offered at the Medford and Health Sciences campuses. We are working with partners in individual programs and departments to organize these training sessions and scheduled dates will be posted on the Training Calendar as soon as they are determined. As fall classes get underway, many instructors are looking to reach out to their students: You might want to send a welcome email to the class, call attention to upcoming readings and assignments, alert students of a last-minute room change, or send other important messages. Canvas has two tools to help you get in touch: Announcements and Conversations. How do Announcements and Conversations work? What does this tool do? Announcements are designed to allow instructors to broadcast information out to an entire class. Conversations can be used to communicate with a course, a group, an individual student, or a group of students. I just sent a message. When will my students receive it? By default, user notifications are set to “Notify me right away.” Students will get your message about 30 minutes after you send it unless they have edited their notification preferences. For more, see below: "How (and when) will students receive my messages?" By default, user notifications are set to “Notify me right away.” Students will get your message about 30 minutes after you send it unless they have edited their notification preferences. For more, see below: "How (and when) will students receive my messages?" Will I get a copy of messages I send? By default, users will not receive a copy of any announcement they send. To change this, edit your notification preference for “Announcements created by me.” Change this to “Right away,” “Daily,” or “Weekly.” By default, users will not receive a copy of any message they send. Will a copy of my message be stored in Canvas? Any announcement you send to a given course is saved in the Announcements tool in the course site. Any message you send through Conversations will be stored in your Canvas “Sent” box. My site is unpublished. Can I still contact my students? Announcements can be created in an unpublished site but students will not be notified. (However, you can delay an Announcement to a later date and time.) You cannot send a Conversation to students in an unpublished course. Where can I learn more about this tool? See the Canvas Guides for Announcements. See the Canvas Guides for Conversations. How (and when) do students receive my messages? Communications in Canvas work differently than in Trunk. All Canvas users, including students, control their own notification preferences. Students can decide what kind of notifications they receive from Canvas, when they receive them, and what email addresses or mobile phone numbers they’ll be sent to. By default, every student receives notifications as emails to their Tufts email address; however, they can opt out of emails by changing their preferences. You cannot override a student’s preferences and force Canvas to send them a message. At the beginning of the semester, tell your students how you plan to communicate with them. Will you post Announcements, send messages through the Conversations tool, or directly email students via an elist or the SIS roster tool? Will you send communications frequently or only when information is critical and time-sensitive? If you plan to use Announcements, consider requiring your students students to set their preferences to receive immediate notification of Announcements. Show recent announcements on your course home page and encourage students to log into Canvas and check the course site frequently. If you plan to send regular communications, such as a weekly overview of upcoming assignments, do so on a consistent schedule and tell your students when to expect the message (say, Sunday nights at 6pm or every Tuesday and Thursday after class). For more ideas, see what other teachers are saying in the Canvas Community: Communicating with students in Canvas. Need help planning your communications strategy or have questions about the tools? Reach out to the Canvas Support team at canvas@tufts.edu. Canvas includes a set of default notification preferences you can receive for your courses. 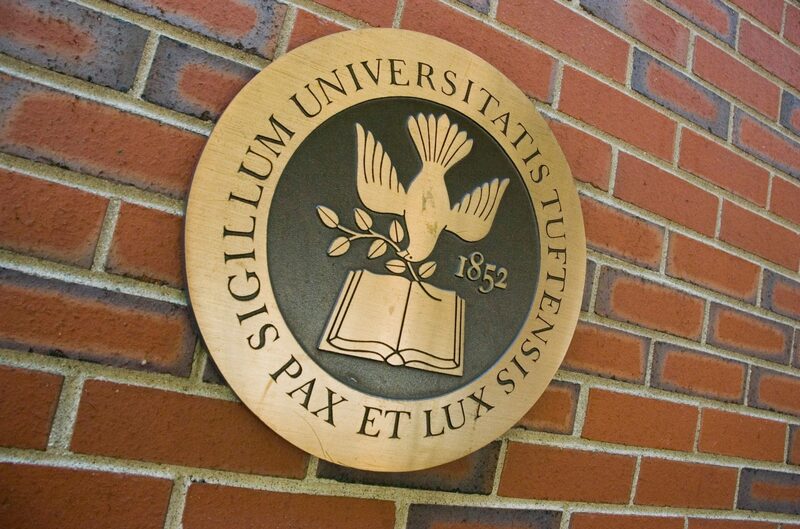 Notifications are sent to your Tufts email address and any additional Canvas Contact Methods you add to your account. However, you can change the default settings and set your own notification preferences. These preferences only apply to you; they are not used to control how course updates are sent to other users. Each individual student and instructor can decide what notifications they want to receive and how frequently to receive them. To edit your notifications preferences, click on the Account link at the top of the navigation menu in Canvas and select Notifications. Clock: Receive all notifications in a daily email. Calendar: Receive all notifications in a weekly email. X: Do not receive notifications for that item. Note: Each notification preference will apply to all of your courses. They cannot be set for each course individually. This content is adapted from the Canvas @ Yale documentation. If you use Trunk, you might depend on a particular Trunk tool. Maybe you use Resources to upload files and distribute them to your students, or maybe you use the Tests & Quizzes tool for weekly assessments. You might post Announcements about important course information or set up Forums to get your students talking. You’ll be able to do all that – and more – in Canvas. Canvas offers many of the same tools that Trunk does, but they may have different names and work in different ways. Below is a list of common Trunk tools, what those tools are called in Canvas, and more information about how the Canvas tools work. Announcements Announcements How do I make an announcement in a course? Assignments Assignments How do I create an assignment? Calendar Calendar How do I use the Calendar? Forums Discussions How do I create a discussion as an instructor? Gradebook Grades How do I use the Gradebook? Lessons Modules What are Modules? Messages Inbox - Conversations What are Conversations? My Workspace Dashboard / Courses / Notifications / Profile How do I use the Dashboard? Resources Files How do I use Files as an instructor? Roster People How do I use the People page as an instructor? Sign-up Calendar - Scheduler What is the Scheduler? Syllabus Syllabus How do I use the Syllabus as an instructor? Tests & Quizzes Quizzes What are Quizzes for instructors? 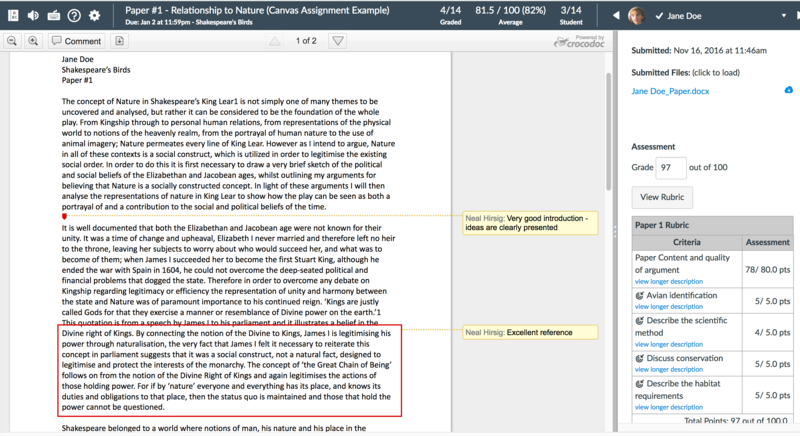 Markup, grade and return student papers all within the Assignments tool.